Scientists from the Fraunhofer Institute for Interfacial Engineering and Biotechnology (IGB) in Stuttgart are currently developing a new type of thermal storage system. The new technology will allow heat to be stored loss free in the smallest of spaces for lengthy periods of time, for use as and when required. The new system can store three to four times the amount of heat that water can, so it only requires storage containers around a quarter the size of water tanks. Moreover, it is able to store the heat loss-free over lengthy periods of time and can even operate at temperatures well in excess of 100 degrees Celsius. The new system contains zeolite pellets, from the Greek zeō, meaning ‘boil’ and lithos, meaning ‘stone’. Normally this material is used as an ion exchanger, for example to soften water. Zeolites are porous, they have a huge surface area: A single gram of these pellets boasts a surface area of up to 1000 square meters. 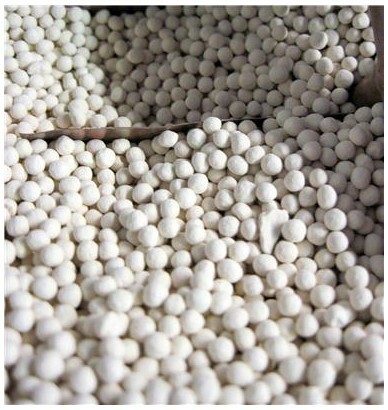 Fraunhofer's Heat Storing Zeolite Pellets. Click image for the largest view. Image Credit: Fraunhofer IGB. When the zeolite comes into contact with water vapor it binds the steam within its pores by means of a physicochemical reaction, which generates heat. In reverse the water is removed from the material by the application of heat and the energy is stored, but not as a result of the material becoming palpably warm – as when water tanks are used. What is stored is the potential to adsorb water and in the process release heat; the term ‘sorptive thermal storage’ is frequently used to describe these systems. And provided the dried zeolite material is prevented from coming into contact with water, it can store the heat for an unlimited amount of time. The institute’s industrial development partners ZeoSys GmbH in Berlin, were responsible for the material testing side of the project, investigating which of the various zeolites would be best suited for the purpose, how big the zeolite pellets needed to be, and whether or not the material would remain stable even after numerous storage cycles. They proved that heat could be stored and discharged many thousands of times without the system showing significant signs of wear and tear. The researchers subsequently up-scaled their operations to the current test facility, which has a storage volume of 750 liters and is mounted in a transportable container, along with all the additional equipment it requires. The portability allows the scientists to test the system in a variety of locations under realistic conditions. The next stage of their work will be to reduce production costs, further optimize the system and adapt it for a variety of applications. Ultimately, the goal is to be able to store heat both in industrial installations and in small combined heat and power plants such as those used in larger residential buildings. To start with, priority will be given to industrial applications. “It would be ideal if we were able to devise a modular system that would allow us to construct each storage device to suit the individual requirement,” says Blicker. In general about half of the total energy content of fuel is released as lost heat, which typically dissipates into the atmosphere unused. Large quantities of heat likewise escape from combined heat and power plants, not to mention many industrial installations. The root of the problem lies in the fact that the heat is not generally used at the time it is generated – and options for storing it are limited. In heat saving trials water tanks have been used for the storage, but water can only absorb a finite quantity of heat. With water the heat can only be stored for short periods of time, because even when the water tanks are insulated, the water gradually loses its heat to the surrounding atmosphere. As a secondary heat recovery the idea has great appeal. Portability also presents an opportunity. The explanation suggests the engineering to be comparatively simple and easy to construct. The question will be if the heat is of a temperature and can be recovered at a pressure that will yield worthwhile efficiency. Those matters would seem solvable if not even exploitable. This is a great idea that many heat producers could use to cut fuel costs or produce more revenue from fuel use.